Hello, Sara here, *taps microphone* is this thing on? As you can see I have started up a blog. For someone terrified of such things (I have had my personal blog for a year and haven’t written a thing on it yet) this is a huge undertaking for me so please bear with me as I figure this thing out. This blog is intended for all of those who have participated in and belong to the North Shore Region of NaNoWriMo (National Novel Writers Month). Specifically our After-NaNo Writing and Support Group. Two years ago, fellow NaNo participant Lynne held me down and tortured me casually suggested that I become the Region’s Municipal Liaison, as our former ML (and wonderful person in general, Liz) abandoned us for the West Coast moved back home with her new baby. After freaking out applying for and getting the position, I researched other regions to see how I could make ours better than everyone else’s great. Then, after much brainstorming, Lynne and I decided we needed a proper name and mascot for our regional group. 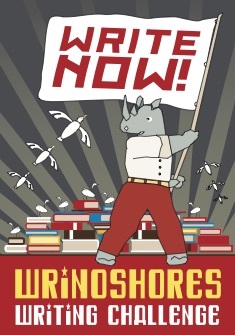 We came up with the name WriNoShores (Writers of the North Shore) and our mascot, a handsome Rhino named George (named by fellow participant Caroline, after her cat). Two years later and much procrastination from me I have started up a year-round writing group as requested. It’s AWESOME (and full of great supportive people) and if you haven’t already you should come check us out. The WriNoShores meet twice a month, every first and third Sunday at Plum Island Coffee Roasters (PICR) in Newburyport from 1-5pm. You can view and comment to your leisure, however if you wish to post on the site you will have to request authorship which keeps out the rabble. You can email me at sara@wrinoshores.com or the contact page in the menu and I’ll send you an invitation. You will need a wordpress account. If you don’t have one, sign up for a wordpress account, it’s free and easy. Please feel free to contact me with ANY questions. I’m here to help. I will update this post as needed and I will totally let y’all know if I do. Woot! Sara taking the initiative. I didn’t even have to water board gently cajole her into it first. It’s exactly what we needed. Thanks Sara! If you are a member and need the password to the members only page, just shoot me an email at sara@wrinoshores.com.